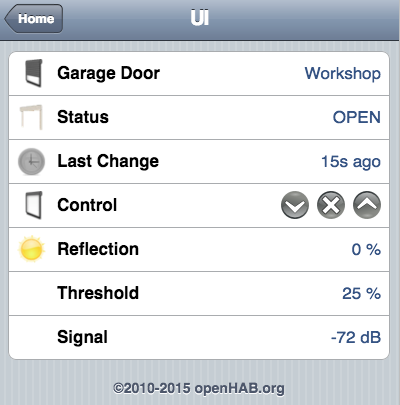 The Garadget is cloud-based device that “futurizes” your existing garage door opener, letting you open and close your garage door from anywhere, including via openHAB with this binding. Remote access is made possible with the particle.io REST API. Where can I find my device identifier? A device identifier is a long decimal number. One way to find the number is to login to garag.io and read the URL you were taken to in the browser’s address bar: http://garag.io/my/settings.php?id=270041234567343432313031 The final component of the URL is your device identifier.